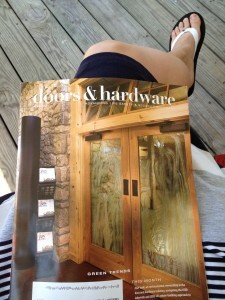 I found the time on Sunday to sit and relax on the porch and read the April edition of Doors & Hardware magazine. I am glad I did. DHI does a great job bringing us stories of the people, products and processes of our industry. I especially like articles that offer helpful installation and problem solving tips. This edition had a nice article fitting that bill. “Plumb Bobs Don’t Lie: 4 Door Installation Tips” written by Scott Foley. Scott is a project manager with L.I.F. Industries, Inc and has 25 years in the industry. Thanks for the great tips, Scott! Another good story was “Watching Sales Growth Go To Waste” by Dr. Albert D. Bates. This one is a must read if you are struggling to increase profit margin. He urges distributors to take control of gross margin and payroll expenses to ensure that strong profits follow sales growth. Be sure that you are stealing a couple of minutes out of your hectic schedule to stay tuned with the happenings of the industry. Doors & Hardware Magazine is full of information to assist you in your journey in this great industry. Looking forward to seeing some of you in Dallas this June for CoNEXTions!